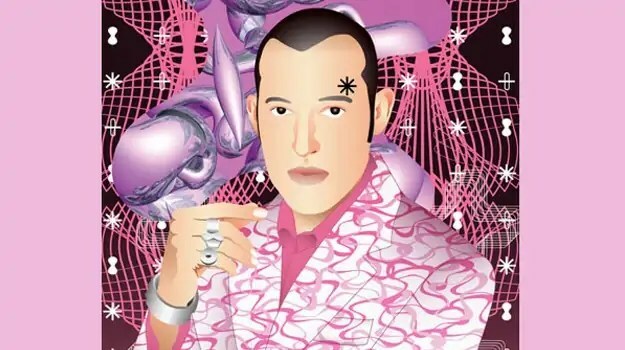 Few industrial designers have branded themselves with flamboyant tastes and pink outfits, yet Karim Rashid has created a solid name for himself as a multi-disciplinary designer who has worked with everybody from Alessi to Coca Cola and Dupont to Dirt Devil. With his creative direction guiding everything from product design to branding and even fine art, perhaps it comes with little surprise that his latest project doesn’t come in the form of visual design at all, but rather in the form of an Electro-Pop album where he shares his philosophies on design and the world at large. While Change the World EP is Karim’s first actual album, he has spent quite a few years sharpening his ears over the old ones and twos at various parties and clubs—he even has a contact form on his website in case you want to book him for your son’s upcoming Bar Mitzvah. Robbie teamed up with Facebook earlier this week to reveal all about his new album, Swings Both Ways. Sat on a sparkling stage, Chris Heath quizzed Robbie about every track on the album as well as putting your own questions to him. From high-octane opener Shine My Shoes to personal favourite No One Likes A Fat Pop Star, Robbie gets right down to the nitty gritty in this special three-part video. The first instalment is available to watch now; parts two and three will be uploaded on Thursday and Friday, so keep an eye on Robbie’s Facebook page for more!